Family photos serve as heartwarming reminders of good times. Personal touches like this are what transform a simple house into a welcoming home. One of the biggest issues home owners have when trying to include family photos in their design is that they can clash with their home's style or with each other, resulting in an unfocused and sloppy look. Below are some of our favorite collections of family photos and some tips to avoid the messy look. 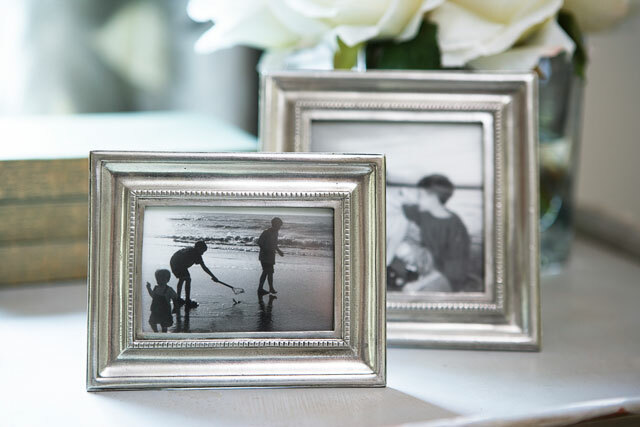 One easy way to make your family's photos work with your home's style is to select frames that work together. Frames in a range of materials, colors, and sizes can make a collection of photos look busy or haphazard. Instead, consider selecting one style for the grouping's frames for a cohesive look. We've found that a selection of square silver frames consistently pulls together an otherwise disjointed selection of photos. Choosing to frame your photos in a neutral color ensures that the collection of photos will not need to be swapped out when renovating a space. While a gallery wall is a beautiful way to display all of the best family photos at once, one or two of your favorites can be a simpler way to bring the photos into your design. It can be easier to find room for a pair of beautiful pictures on your bedside table, desk, bookshelf, or in your foyer than to find room for an entire gallery wall. These smaller frames allow you to change the photos often, cycling through a ton of treasured memories throughout the year. On the other hand, bold gallery walls can make your loved ones the highlight of the room and can have a serious welcoming impact on your space. Whether you'd be better off with a big statement gallery wall or a few smaller frames around your home depends on your photo collection and taste. Another tactic to make your family photos more unified and more likely to blend with your design choices is to have them all done in black and white. This gives photos taken at different times a sense of togetherness. Gorgeous gallery walls with a big collection of photographs are dazzling when combined with this black and white technique. The gallery wall in this bedroom is an excellent example of the unifying capacity of an all black and white collection of photographs. Just because family is the focus doesn't mean it has to be the only framed item in a room. Family-photo gallery walls don't have to be exclusively filled with photos. Some art pieces mixed in to your gallery can fill out a sparse collection and make the display feel more creative. Alternatively, including a few family photos on your bookshelf where you could have placed an art print is a subtle, elegant way to feature your pictures. Here small, square frames containing family photos effortlessly share space with larger frames containing botanical prints. There are so many beautiful ways to capture your family's favorite moments; we hope this post serves as inspiration for your home. 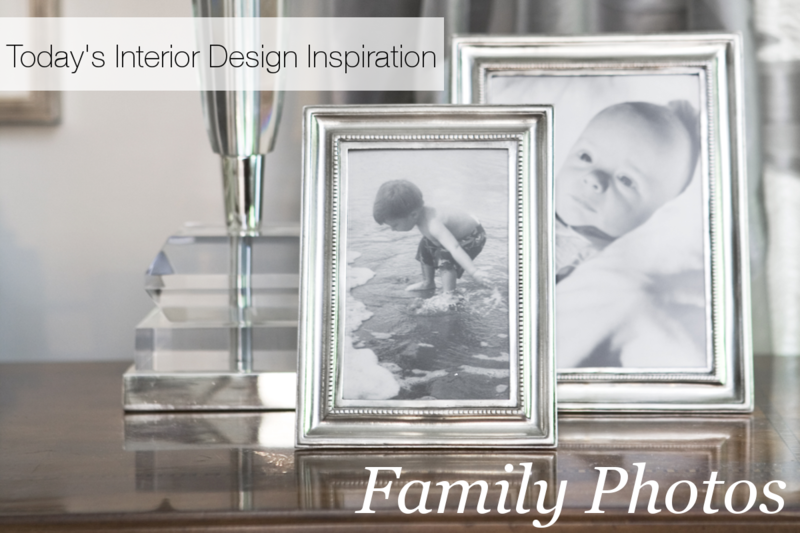 What is your favorite way to display your family's photos? Share with us in the comments section below. Neutrals are an excellent way to pull your home together. For more tips on using neutrals around your home, click below.